Exterior view of Solvay Processing Company's plant in Syracuse, New York. The company manufactured soda ash and other alkali products. 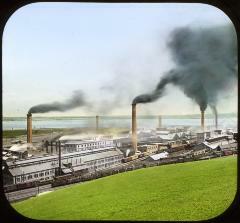 In the image, smoke pours from smokestacks on several of the company's many buildings. Trains run on the tracks to and from the plant. In the background is Onondaga Lake.